It’s Cambridge, England, in 1348. 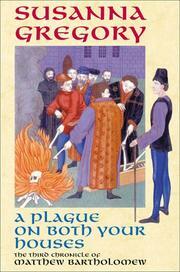 If the black plague doesn’t get you, beware of the black gowns and the scheming, black-hearted academics wearing them. In his third outing, physician-teacher Matthew Bartholomew (A Bone of Contention, 1997, etc.) is once again in a fine mess. Bad things start happening with the alleged suicide of Sir John, the Master of Michaelhouse. It’s a particularly gory suicide, too: death by entanglement in a waterwheel. And it has Matt wondering. After all, he was with Sir John only the night before, listening to the master’s enthusiastic plans for the college’s growth and development. And soon enough, Matt’s skepticism proves warranted. There are plots, nasty ones, the aims of which the estimable Sir John was blocking. These seem at first to be centered in, of all places, that other great university. It’s Oxford versus Cambridge, Matt’s told, but in a contest deadlier than any that ever took place on the Thames. Only one great university can be allowed to survive. Or is all that just smokescreen? Is it just a wicked grab for money and power by envious men who see themselves as unfairly bypassed? Before Matt can get at the truth, he finds himself with a big-time medical emergency on his hands: suddenly, the Black Death strikes, felling close friends and enemies alike, and putting Matt at terrible risk. First-rate for the history, but there are so many plot lines, and so much tedious talk about them, that interesting characters eventually lose their vitality, and the 14th looms like a century and a half.